Step into this Forest River Freedom Series 1950 as you head out on an RV adventure. 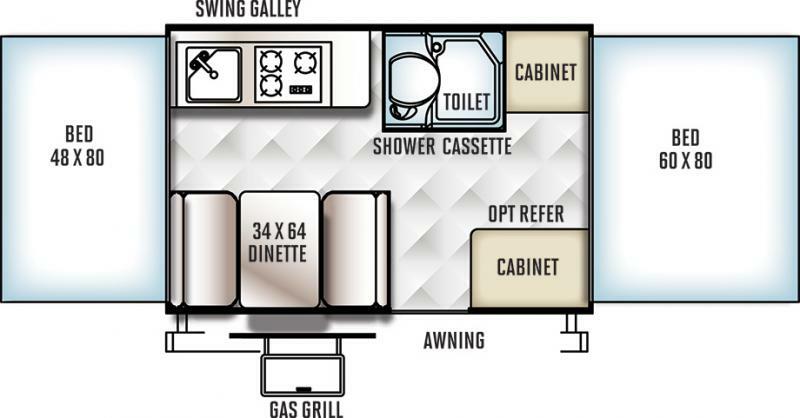 This folding pop-up camper by Forest River includes a shower cassette and toilet area, plus a front 60" x 80" tent bed and rear 48" x 80" tent bed. The booth dinette and cabinet with optional refrigerator are along the entry wall. The dinette provides an additional sleeping space when needed. Come take a look at this great trailer it is as Ray Citte RV at 1677 West Riverdale Road in Roy Utah 84067 or give us a call 801-773-4951. Exterior Closed Height 5' 6"